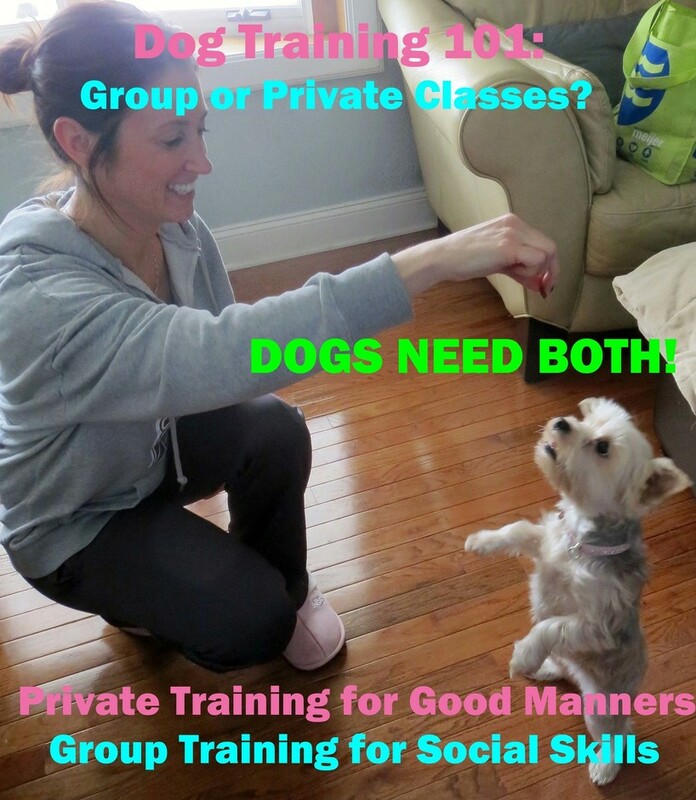 Dog Training--Private or Group Classes? Lots of Facebook messages, emails, and phone calls have come pouring in this past week about our upcoming Spring puppy and dog training classes. The press release hit the newspaper yesterday and already two classes are full! Our group classes are only $60 for six weeks of training and filling up fast. A great deal for sure--only $10 per class. Although that's a great price and you and your pup or dog will learn all the basic commands and even some advanced training skills, sometimes private sessions are needed as well. Private dog training is very affordable as well--only $30 per session. In these private sessions you will get the benefits of working one on one with me for 30-45 minutes and I will show you everything you need to do. One lady signed up for our spring dog classes and paid online, then sent me an email about how she couldn't wait for classes to start because her dog was "crazy". Being a dog trainer, that immediately triggered a warning signal in my brain. After speaking with the dog owner in more detail I learned that she has a very hyper chocolate lab that jumps, runs, and is out of control. I explained how having a couple private training sessions to break the bad behaviors before the class might not be a bad idea. Thankfully, she agreed. Group classes will help dogs gain great social skills, obedient skills, and some manners, but quite honestly, manners are better learned in private sessions in the home. It is much easier to break bad behavior in a private one on one setting than it is in a group setting with ten other dogs. Besides, as a dog trainer, I have to meet the needs of the entire class, so I won't have the time for the extensive one on one training many pups or dogs may need. Dog training classes are meant to be educational, enjoyable, and fun, but if we bring a dog that isn't ready for a group setting, it can be a real struggle, Quite honestly most pups and dogs need private training as well as group classes. Many of the dog owners who signed their pups/dogs up for our group classes are also taking a few private sessions before. In my private training sessions we work on modifying the pup or dog's bad behavior, correcting that behavior, and reinforcing positive behavior. When I come into a home I show the owner everything they need to do to break that behavior in the very first session. For some dogs, this one time training session may be all they need, for others, they may require 2-4 sessions. Every dog is different. But in 99% of all dogs and pups I train, they are much improved after only one session. I recently worked with a young married couple expecting a baby. They had two dogs that were out of control and crazy with barking and jumping when people came to their home. They had been through all the Petco and Pet Smart dog training classes and the husband was very negative about having another trainer work with them. Actually, they were both a little skeptical at first, but wanted to try to get the dogs under control before their baby arrived. I've only had two sessions with this couple and they cannot believe what a difference the training has made. The dogs are more settled, will stay on their beds when someone comes to the door, and their barking and jumping are almost completely broken, besides that they are learning more advanced commands they were never taught and are obeying them.. I always tell dog owners, "You may not have a perfectly trained dog, but you can have a better behaved, more obedient dog with manners." Lisa Freeman, AKA the Dog Lady, from Owosso, Michigan, is an AKC Evaluator, Dog Trainer and Certified Pet Therapist. She specializes in dog obedience, pet therapy, aggression, behavior modification, and service dog training. For more information about her private training or group dog classes, please email her or click here to go directly to her dog training page and sign up today. Classes and spacing is limited. So please hurry.